Damien the Antichrist, now thirteen years old, finally learns of his destiny under the guidance of an unholy disciple of Satan. Meanwhile dark forces begin to eliminate all those who suspect the child's true identity. The now adult Antichrist plots to eliminate his future divine opponent while a cabal of monks plot to stop him. Two attorneys adopts a mysterious orphan girl as their daughter, unaware she is the new antichrist; next in line from Damien thorn. An American official realizes that his young son may literally be the Devil incarnate. A documentary looking at the real-life events behind The Omen remake. Ann Thorn: Charles, I heard about your reporter friend, what's her name? Dr. Charles Warren: Joan Hart. Ann Thorn: I'm so sorry. Dr. Charles Warren: Yes, it's so strange. She got hit by a truck on a deserted highway. Q: Was "The Omen" originally written to be a trilogy? 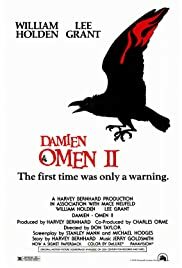 Q: Can "Damien: The Omen II" be compared to the four horsemen of the apocalypse?